When I was little my Dad used to throw the ultimate backyard BBQs. From sweet corn on the cob with honey butter and salt to his famous picnic salads, Dad was the man who knew how to make you smile with a Dixie paper plate full of your favorite colorful summer food. I remember sitting on checkered picnic blankets with my cousins as we held juicy watermelon wedges and patiently waited for the rest of our meal. As I got older I began to crave Dad’s salads; my favorites being his tuna noodle salad with fresh sweet peas and his tangy sweet dilly cucumber salad. The tuna noodle salad was made with baby round noodles and often eaten straight from the bowl with a spoon. 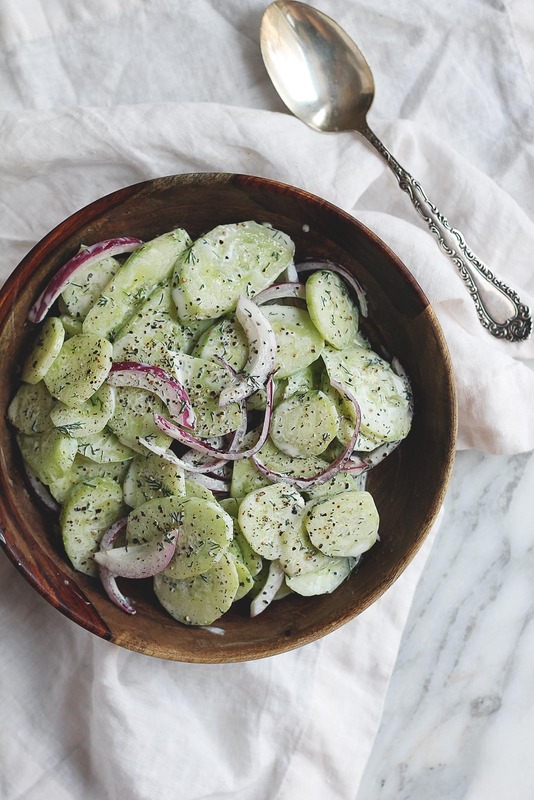 The cucumber salad was made with thinly sliced cucumbers that marinated a few hours until they lost their intense crunch and soaked up the sweet dressing. When high school graduation came around and it was time for my grad party, I asked Dad to make both of his famous salads and to save some for me in the fridge, just in case it all got eaten (it did). It was one of the last things Dad would make for me before he passed away that Summer. Simple, but one of my favorite memories I have: Dad in our kitchen mixing together something he knew so well, then going to set up the badminton net in the backyard. I can’t say that Dad made a healthy cucumber salad as his version happened to call for Miracle Whip and sugar. While I always respect an original, I couldn’t help but swap out the mayo for protein packed greek yogurt, and use less sugar than called for in his recipe. I know he wouldn’t mind me making just a few adjustments (smiling as I write this). 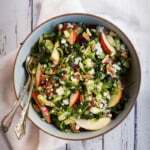 This recipe today is created in partnership with my friends at Peapod, who asked me to share a summer side dish for their blog FromthePod.com. 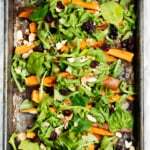 I can think of no better salad recipe then this one on a warm summer day. 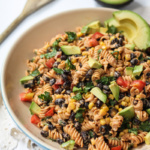 It’s easy to create and one of my favorites to chow down on because it’s both refreshing and light. P.S. Ordering from Peapod when you are planning a BBQ is a breeze. This salad is also particularly wonderful on top of grilled chicken because it slightly reminds me of a greek cucumber sauce. I hope you enjoy it as much as I do! Dad's fresh Dilly cucumber salad made with greek yogurt instead of mayo. 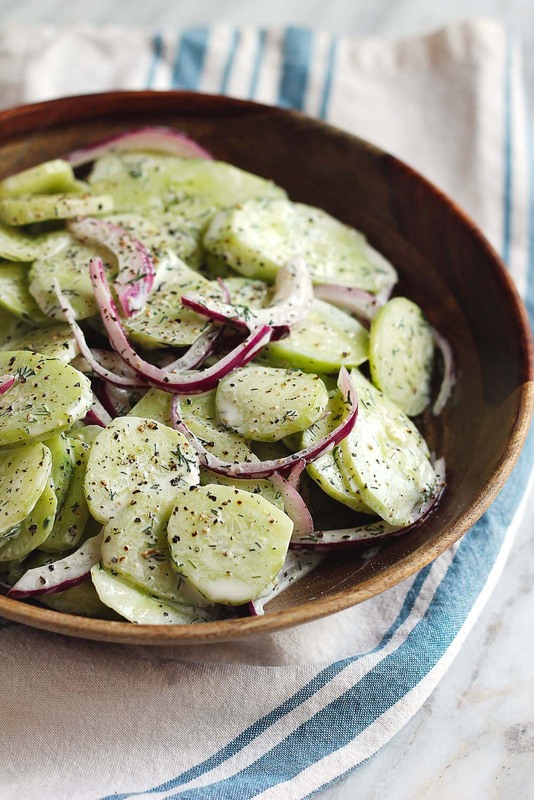 A refreshing, sweet and tangy summer salad! Add greek yogurt, dill, apple cider vinegar and honey/sugar to a large bowl. Mix together to combine. Next add in cucumbers and red onion to the bowl and fold everything together until well combined and the dressing has coated the cucumbers. Season with salt and pepper to taste. Cover and refrigerate for at least an hour before serving. Best if served within 24 hours of making. 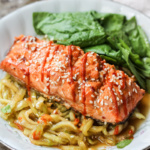 This recipe is in partnership with Peapod, a brand I trust. Thanks for supporting brands that help make this site possible! You can see more of my recipes on FromthePod.com. 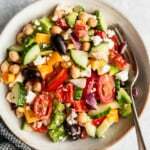 10 Responses to "Dad’s Dilly Greek Yogurt Cucumber Salad"
My family makes a similar salad, but boy is it refreshing! I love that you used greek yogurt in place of the sour cream for a lighter fare! 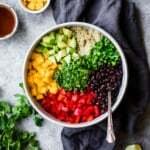 Absolutely love the colors of this salad, Monique! Thank you for sharing such a sweet story with us as well. Oh! I love cucumbers. I’ll try this out soon. Thanks for sharing. Looks like a great summer recipe. Trying it soon! Made this salad exactly as written and it is great! The flavorings are zippy and refreshing in their own right and you don’t really wish it had sour cream “instead”. You father sounded like he really cared to make family gatherings special. just found your blog and am loving it!